Many of us have credit cards, but some of us never open our credit card statements. It’s easy to see your due date and pay online—and not look at the nitty gritty. And seeing a long list of monthly purchases can be overwhelming. But there’s some very worthwhile information in those pages and pages of documents, like what your minimum payment is, how you can avoid paying interest, and what parts of your balance are calculated at different interest rates. 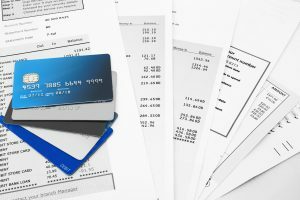 With over 180 million Americans having a credit card, we wanted to share some of the basics of what you can see when you get your monthly billing statement. First? Simply open the envelope! If you’ve opted for paperless statements, when you log into your credit card account, you should see an option to either open or download a PDF of your statement. There’s a snapshot of information on the first page: your minimum payment, your balance and your due date. This page also typically shows your previous balance, what you paid last month, and a readout of what has accrued this month between purchases, cash advances, fees and interest. That’s where you can catch some warning signs. If you see fees listed, but don’t think you should have any, check further into the statement for more information. You might be able to call the credit card company to dispute or negotiate the charge. But if you’ve violated a rule of your credit card agreement, take note of why, so you can avoid it next time. Speaking of fees, you’ll also see a late payment warning. This section shows the consequences of sending your payment late, i.e., after 5 p.m. on the payment due date. If you see a high number on the interest charged line, take a minute to look at the last page(s) of your statement. You should find the interest charge calculation. This is a breakdown of the different types of balances you’re carrying and the different interest charges associated with them. It’s also where you’ll see what portion of your balance might be carried on a special promotional rate — and when that promotional rate ends. If you scored a zero percent transfer way back, check that date closely. Interest will hit hard after it passes, so try to get it paid off before then. And if your interest rates are very high here, consider calling your credit card company to negotiate a lower rate. If that doesn’t work, consider transferring your balance elsewhere or restructuring your monthly budget to get the card paid off as quickly as possible. Know that if you do have an ongoing revolving balance, anytime you use your card, even just one swipe starts accruing its own interest starting immediately. There’s no built-in grace period like there is when you’re starting from scratch. Be sure to set the card up to make at least the minimum payment, and talk with your financial planner about what more you might be able to do to help that makes the most sense for your personal financial situation. If you want to try to pay off the card with a revolving balance, look for the pay in full amount. And we suggest calling to verify that number, to make sure no other interest has been accruing. Speaking with a customer service representative cuts out the uncertainty and provides the most up-to-date information. Between the first page and those last pages are the purchases you made last month. If you can, take some time to look through these closely and really think about how you spent money last month, and if you’re happy with the purchases you made. If you want to make a change in how you spend money each month, making a budget it a great way to start. One size does not fit all. Your income, expenses and financial goals will vary from your friends, neighbors and colleagues’. From emergency savings to debt reduction, retirement objectives to living for today, and cash flow to insurance needs, your personal financial plan should be tailored to you and fit your needs only. A fee-only CERTIFIED FINANCIAL PLANNER™ progressional can help you make the right decisions. Kelly Luethje is a CERTIFIED FINANCIAL PLANNER™ professional and founder of Willow Planning Group, LLC. She provides financial education and guidance to help you live life on your terms. Kelly can usually be found on a mountain, or by a lake, working virtually with clients across the country. ARMs vs. fixed-rate mortgages: Which is right for you?Talking Taxes – What Can You Still do this Year?